There are two exhibitions running in the city right now--just three blocks from each other--that are not only worthwhile to visit for their own charms, but because they give access to some fabulous old New York spaces. The materials in the rooms are an eclectic assortment, from aluminum foil in the coffered ceiling to recycled wallpaper rollers reused as column capitals. A gorgeous Tiffany fireplace with turquoise tiles stands against one wall of the Veterans Room and the walls are capped by an elaborate frieze depicting twenty great battles from the dawn of history to the modern era. 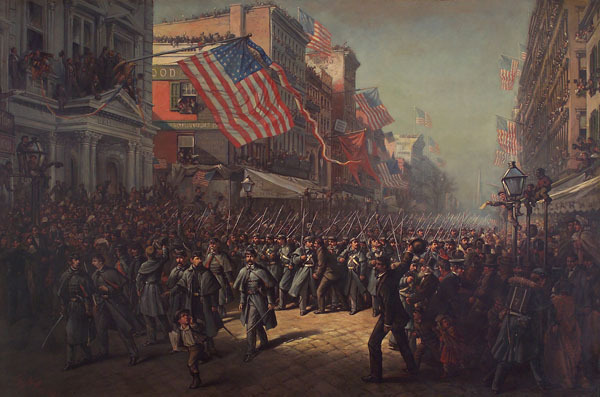 Also on view at the armory is Thomas Nast's Departure of the Seventh Regiment to War (reproduced above), which hangs in the hallway just to the left of the entrance (near the Veterans Rooms). No matter what your opinion of Nast, this is a great painting. At the nearby Explorers Club on East 70th Street, Mark Dion's Phantoms of the Clark Expedition (on until August 3) takes a look at the ephemera associated with Sterling Clark's 1908-09 scientific expedition to map China's northern provinces. The exhibition features (in the artist's words) "not only what Clark and his team took from China but also what they brought to the site of inquiry. Thus, the equipment and provisions to undertake such a complex tour are given a new importance that emphasizes the labor of the journey rather than the particular scientific results." Dion and his team have created papier-mache versions of everything from the expedition's campfire to the cages used to haul chickens--there's even a replica of Clark's hat. The show is set up in the Explorers Club's Trophy Room on the fifth floor, a space originally designed to be an art gallery. The club is housed in a mansion built by Stephen Clark--Sterling's brother--thus forging a connection between the building and the exhibition. It is a great opportunity to get a peek into this space that is normally off limits to non-members. 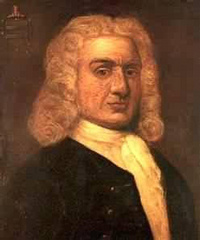 On this date--May 23, 1701--Captain William Kidd was hanged for murder and piracy at the so-called "Execution Dock" in London. 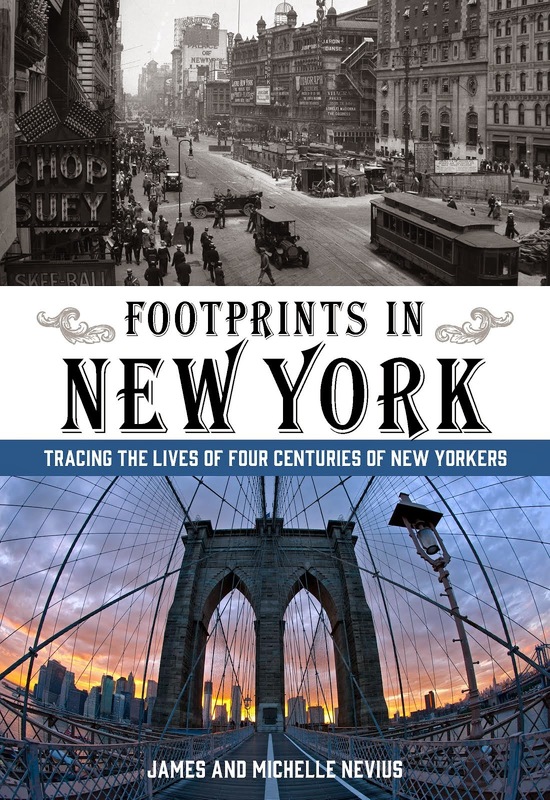 Though born in Scotland and hanged in England, Kidd is most associated with New York City, where he lived at the peak of his career. Today, historians disagree as to the extent of Kidd's outright piracy. Most often, he sailed a privateer with a letter of marque, with the explicit permission to attack enemy ships. A prosperous member of New York's mercantile class, Kidd was friendly with a succession of New York's colonial governors, including Benjamin Fletcher. Under Fletcher, "piracy was a leading economic development tool in the city’s competition with the ports of Boston and Philadelphia." Kidd was an active contributor a few years later to the building of the first Trinity Church, Wall Street, lending block and tackle for the hauling of stone and contributing money in pew rent. Kidd never sat in a pew, however; he left New York in 1696 before the church was finished, and was arrested in 1699, having never returned to the city. One of Kidd's greatest prizes, the Quedagh Merchant, was found a few years ago in shallow waters off the Dominican Republic. Kidd had seized the French East India Company vessel on the grounds that it was a French ship and therefore an enemy of the British. That it was actually an Armenian vessel captained by an Englishman didn't seem to matter. The capture of the vessel branded Kidd a pirate and in a vain attempt to clear his name, Kidd ditched the boat in Caribbean and headed back to New York. He ended up in Boston, was arrested, and sent to England where he was convicted and hanged. At the end of the nineteenth century, when newspapers were at their peak, there were 43 daily papers in New York City. Most were published from "Newspaper Row"--the blocks of Park Row near City Hall--from grand skyscrapers that were among some of the first truly notable high-rise buildings in the city. Of particular interest in Joseph Pulitzer's World tower, which was the first skyscraper to proclaim itself the tallest in the world. Designed by George B. 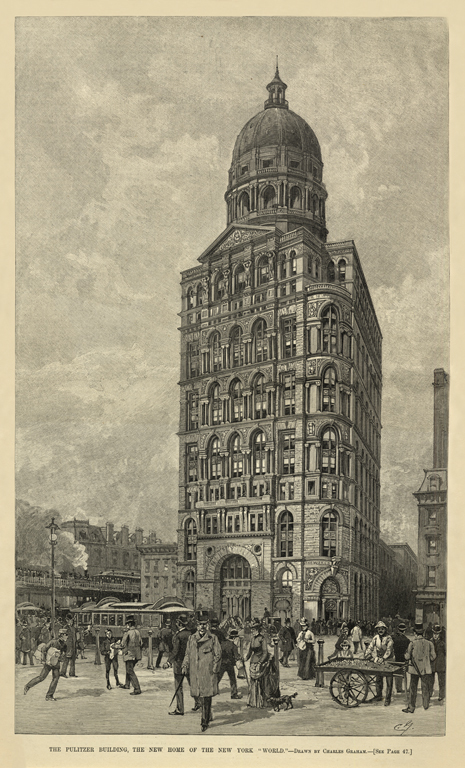 Post (who also built the New York Stock Exchange and City College), the building reached to 309 feet to the top of the dome. 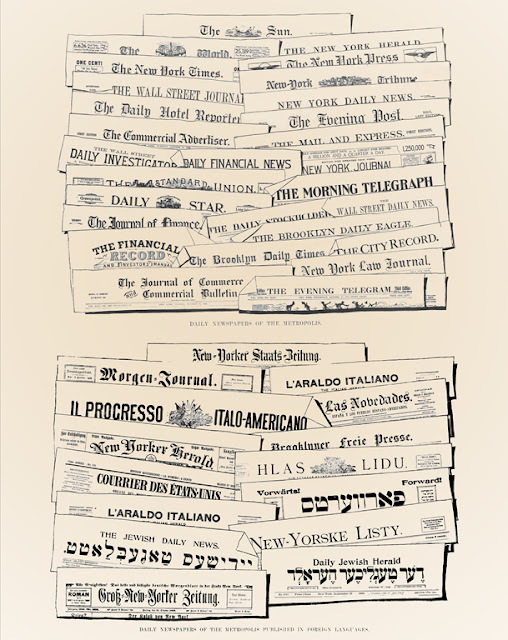 It was a "giant among giants" to use the paper's PR terminology, and soon the Times and Tribune were racing to expand their buildings as they increased their circulation. Alas, the World tower came down when the approach ramps to the Brooklyn Bridge were expanded. The show also focuses on the improvements in technology--from the use of rag paper to the invention of the linotype machine--that kept millions of papers circulating every day. The Skyscraper Museum is located at 39 Battery Place (next to the Ritz Carlton) and is open Wednesday-Sunday, 12-6pm. 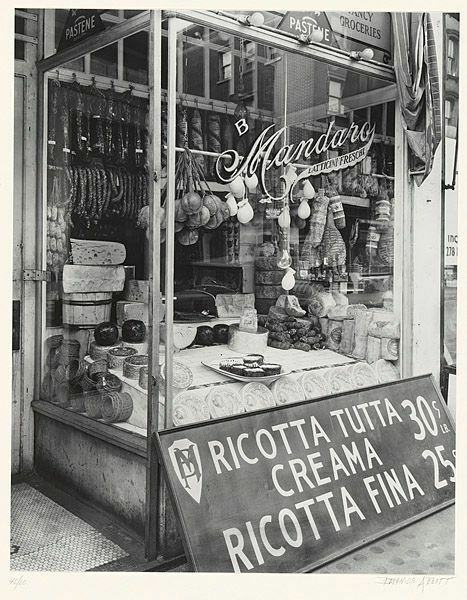 If you can't make it in person, there's a virtual exhibition on the museum's website. Will the World Trade Center be America's Tallest? As you may have read, there is controversy brewing as to whether the new World Trade Center building (formerly known as the Freedom Tower), will be America's tallest building upon its completion. At issue is the building's spire, which was designed to reach a final height of 1,776 feet, thus marking the year of the Declaration of Independence. This piece of symbolism has stayed with the building from Daniel Liebskind's original master plan through architect David Childs's architectural redrafts. However, back in January, the Durst Organization (co-developers of the building) made the decision to strip the spire of its $20 million cladding, leaving it a bare--and functional--antenna. And there's the rub: according to the Council on Tall Buildings and Urban Habitat, decorative spires count in a building's final height; solely functional antennae do not. This controversy between functional vs. decorative height can be traced back to the construction of the Chrysler Building, 40 Wall Street, and Empire State Building in the late 1920s. In March 1929, the announced height of the Chrysler Building was 809 feet, to be topped with a dome. The Manhattan Company [aka 40 Wall Street] rejoined by announcing it was to be 840 feet. By October, Chrysler’s estimated final height had risen to 905 feet and—after a few last-minute drafting sessions by Severance and partner Yasuo Matsui—the Manhattan Company was revised upward to 925 feet. But no one knew of the “vertex,” a secret spire that Van Allen’s crew had been assembling inside the steel dome since September. On October 23, 1929, it was set in place. No newspapers carried the story the next day; no newsreel cameras were on hand to record the momentous occasion. Chrysler and Van Allen were happy to keep their secret—if you can call a 185-foot spire crowning a 1,046-foot building a secret—until the time was right. This stunt caused many to cry foul--could the Chrysler Building really be the world's tallest with the simple addition of a decorative spire? The Empire State Building wasn't going to wait to find out. After William Van Allen revealed the Chrysler Building’s vertex, it became imperative to make the Empire State Building taller without adding a “useless” spire. 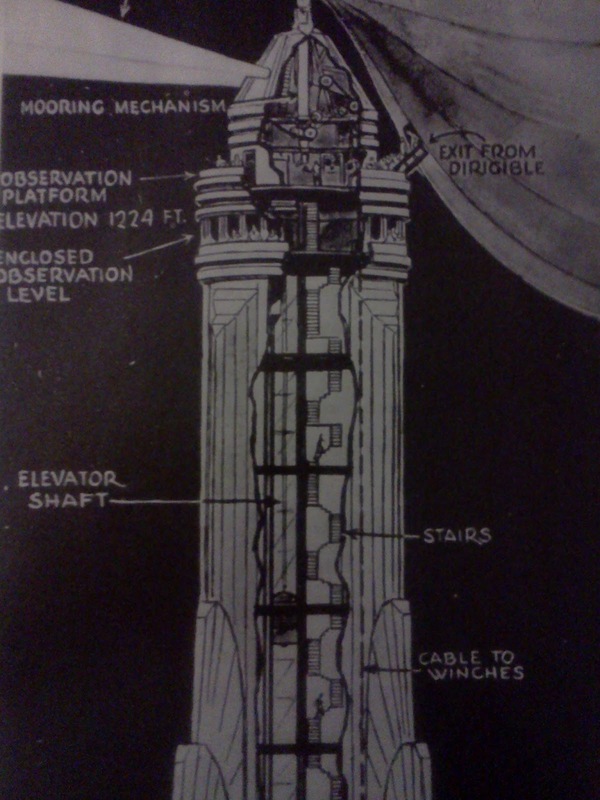 To that end, Smith announced in December 1929 that the top of the Empire State would house a mooring mast, 1,300 feet from the ground, for transatlantic dirigibles. This was utter folly. Not only does a dirigible need to be anchored by both the nose and the tail (which is why they landed at air fields in New Jersey in the first place), the updrafts in Midtown were so strong that a zeppelin the length of two city blocks would have whipped around in the wind like a child’s toy. More to the point, a dirigible’s gondola was in the ship’s center; people would never have been able to (as pictured here in an early publicity drawing) exit from the helium-filled balloon straight into the 102nd-story waiting room. In late September 1931, the New York Evening Journal completed the only successful dirigible mooring. At great danger to life and limb, it delivered a package of newspapers from the Financial District to the Empire State Building’s roof. It looked great on the newsreel cameras, but would be the closest the mooring mast ever saw to real use. It's ironic that the Empire State Building worked to make its spire functional (even if it never would be), when today having a solely functional spire doesn't count toward a building's final height. Of course, to many people the most important measurable statistic is highest occupied floor, which will continue to be held by the Willis Tower in Chicago, whether or not the Council on Tall Buildings decides to count the World Trade Center's spire or not. get RSS feeds from this blog, point your reader to this link. We're a little late to the game on this post -- in fact, you only have one more day to see the Duncan Phyfe exhibition at the Metropolitan Museum of Art. The show closes May 6, 2012 (i.e., tomorrow), but if you are looking for something to do tomorrow, it is well worth a visit. Not only does it showcase the work of a great New York cabinetmaker, it is also your opportunity to examine a little-seen painting of the city, Wall Street 1820 by Johann Heinrich Jenny. 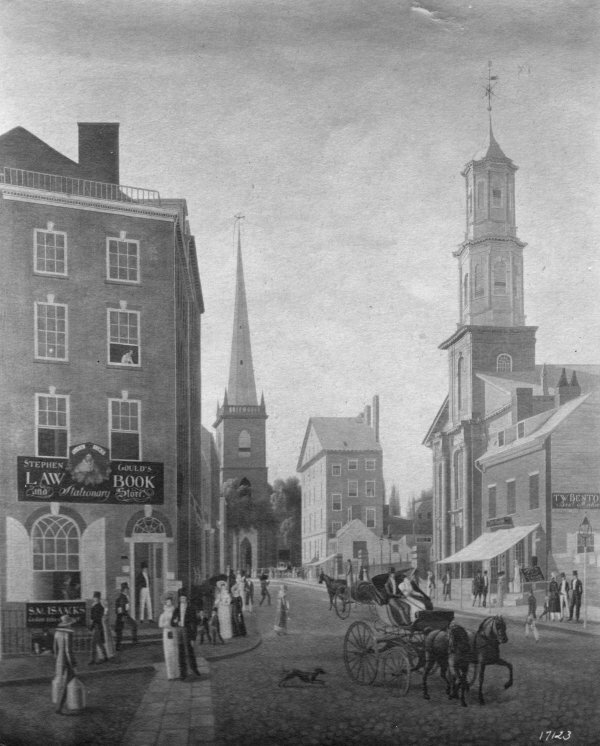 The painting (on loan to the museum from a private collection) is an amazing view of the city nearly 200 years ago. The above black-and-white reproduction does no justice at all to the vibrant colors of the original, which looks like it could have been painted yesterday. 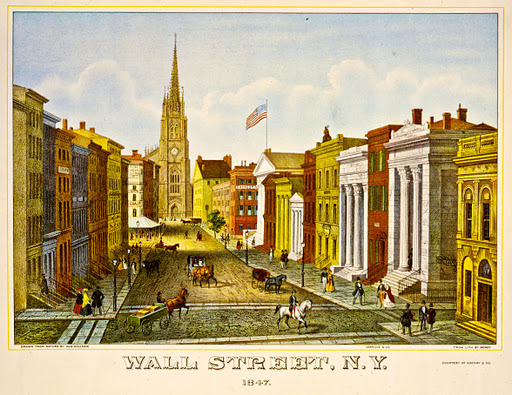 Views of Wall Street were common in the nineteenth century, as it was not just the financial center of the city, but--prior to the move by the wealthy to Greenwich Village and Brooklyn Heights--its residential heart as well. If you do go see the show, there's a gallery talk at 10:00AM on May 6. 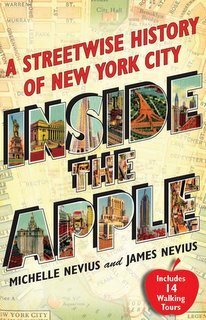 Inside the Apple: A Streetwise History of New York City,available from the Metropolitan Museum's gift shop, and fine booksellers everywhere. Follow us on Twitter -- Facebook -- or subscribe via email.